Who would've ever thought that one of Korean food's most popular export dishes would be its Korean style chicken? Across most continents, various forms of Korean-style chicken have popped up and in Seoul, one is never seemingly more than a few hundred meters away from some sort of chicken restaurant. As common as it is today, in the olden days chicken was mostly reserved for special occasions for the common folks and its most popular method of serving being a boiled chicken dish (baeksook or 백숙) to better serve large families with many mouths to feed. Between boiled chicken and the addictive fried and glazed chicken that's so popular today, an important evolutionary step in the "Korean chicken chain" is the electric grill roasted, rotisserie-style chicken (tongdak or 통닭) which hails originally from the restaurant I'm introducing in today's post. In 1961, Youngyang Center, which literally means" nutrition center", opened its doors in Myeongdong where the restaurant's rows of whole chickens being slowly spit roasted by the window side was a novel notion at that time. As the chicken would slowly turn and roast, the fat would drip away while giving it a golden, slightly crisp skin and ensuring the moisture to be encased. Served simply with some salt and pepper for dipping, this roasted chicken is attributed as the precursor to the Korean style fried chicken that would come about a few decades later and then the various glazed and sauced versions today. Youngyang Center still serves up its roasted chicken today and also a mean samgyetang with both dishes being synonymous with the definition of wholesome goodness. Youngyang Center is approaching its 60th year of operation and if that sounds fabricated, you can speak to my parents and their friends who grew up eating here. I, in turn, was taken here from when I was a kid and even today, my grandmother in particular, continues to insist she takes me here every time she visits Korea. On a pure sentimental note, I imagine it must be a peculiar feeling on her end to see her grandson, now a grown up adult, eating the same roasted chicken as he used to as a kid so long ago. My family even has an anecdote they still like to tell today when long ago I (then a mere toddler), my mom, and aunt came here to dine. I must have had a mighty hankering for chicken that day as I gobbled not one, but two entire tongdak (whole roasted chicken), eliciting stares from the other patrons who misunderstood two petite young ladies having eaten the whole thing themselves and leaving my mom and aunt quite embarrassed when they left. All this to say that whether it was 50 years ago, 20 years ago, or today, the preparation, taste, and even ownership has remained the same, making Youngyang Center a legendary institution. Sure, it may not attract the lines and international fame that Kyochon or even Tosokchon does, but make no mistake about it, the chickens served here are faultless and timeless. The only two chicken dishes served here are samgyetang and tongdak. The latter is what gave Youngyang Center its start but the former is, quite frankly, one of the better samgyetangs I would recommend to any visitor to Seoul. Three varieties of samgyetang are offered here with the basic samgyetang (15.5K), wild sesame samgyetang (17.5K), and wild ginseng samgyetang (21.5K). Same goes for the tongdak which you can get a "baby" (small) size for 11.5K, medium for 15.5, and large for 16.5. They also serve a special set that's only available during lunch in which a baby chicken comes with a small salad, soup, rolls, and the pickled radish (10K). While the preparation method and taste of the samgyetang hasn't changed here, one thing that certainly has is the price. Even a few years ago, I recall the basic samgyetang being around 10K a bowl but thanks to inflation and the ever-climbing real estate of Myeongdong, prices have significantly gone up. But to the restaurant's credit, the samgyetang here is huge. One's face could easily fit inside one of the samgyetang bowls here (please don't try it) and I have yet to see anyone finish an entire bowl of the whole chicken soup, down to the last drop. If you're in a group, I would recommend getting individual bowls of samgyetang and ordering a medium or large tongdak to share. I suppose small eaters could split the samgyetang too (yes, it's that big). Sides are quite simple being kkakdugi and the ubiquitous sweet pickled cubed radish that always comes with Korean chicken. The kkakdugi is meant to be paired with the samgyetang while the pickled radish goes with the tongdak. Both are immensely addictive with their slightly sweet edge being a perfect counterbalance to the savory chicken dishes. The samgyetang comes in individual metal bowls and extremely hot. From the start, the smell of the soothing chicken soup combined with the aromatics of the chopped scallions will immediately start to comfort you. The whole stuffed chicken comes brimming with its fragrant broth- the liquid equivalent of a mother's embrace- and the amount of soup in itself often surprises first time diners. Most, like myself, will order the regular samgyetang. The chicken is a good size and you'll find it having been cooked at just the right temperature and amount of time to leave it just oh-so-tender. I like to remove the thigh and wings and place on a plate to cool down while digging into the main body. Stuffed with a generous amount of glutinous rice, it comes with the other standard samgyetang ingredients of chestnut, jujube, and ginseng root. There's a salt and pepper mixture provided on the side for dipping. Take bits of the chicken pieces, dip into the mixture and enjoy the different cuts of meat with breaks in between with the crunchy kkakdugi and warm soup. For those who have had samgyetang from Tosokchon before, you'll notice there's quite a bit of difference in taste and texture of the soup from the variety here. Tosokchon adds much more to its chicken broth including ground nuts to give it a more complex flavor and thicker profile. Some who are less enthused about Tosokchon's samgyetang complain the soup is a bit "heavy" but that's certainly not the case here. The soup at Youngyang Center is pure chicken broth making it inoffensive to the point I can't imagine anyone other than a vegetarian/vegan not liking the samgyetang here. There's a container for the bones and by the halfway point you'll find just enough space in the bowl to shred some of the chicken meat and mix into the broth-soaked rice to leave a wholesomely delicious chicken and rice soup. Kids will gobble this up but adults too will find the dish just as much endearing. Entirely different in texture, yet still as tasty, is the tongdak. Cut up expertly before serving, the golden shine alone is a work of beauty and you may find yourself questioning whether the chicken has been spit-fired or fried. There's a nice crispy skin that's flavored just right and addictive in its own sense. You can actually watch the roasting process outside in the restaurant windows as they turn in the electric grill where the fat drips away. You'd think this would leave the chicken dry and flavorless but it's the exact opposite. But that shouldn't that be expected of the first roasted chicken restaurant in Korea with almost 60 years of experience? And if you have the luxury of having both chicken varieties in one meal you'll have the opportunity to alternate between the crispy and juicy meat of the tongdak and the fork tender and clean tastes of the samgyetang chicken. Final Thoughts: The chickens at Youngyang Center may not come with the pizzazz of things like spicy sweet glazes and powdered cheeses but if its nearly 60 years of pedigree will show, it’s that they know how to make a good chicken dish. Whether it’s the roasted chicken or the tender chicken from the samgyetang soup, this is Korean chicken in its classic but distinguished form and as the “fore”-chicken of today’s modern varieties, one should pay their culinary respects to this institution. 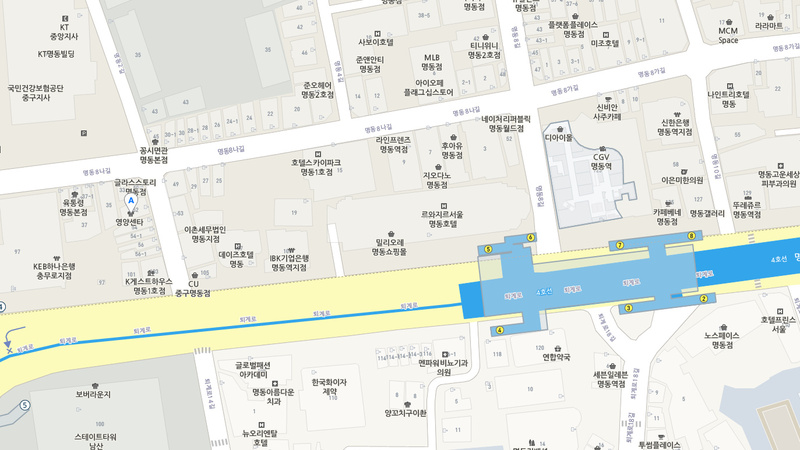 From exit 5 of Myeongdong Station, walk straight for about 120 meters until you get to Myeongdong 2-gil. Turn right and walk about 15 meters and Youngyang Center will be on your left. I've heard there are other sanctioned branches but I've also heard there are many restaurants that are fake and not related to the original. To be sure, I'd only recommend the Myeongdong branch. The special lunch set is only available at certain lunch hours.